There are cricketers who leave a mark on the sport when they play the game and even after they retire from the game. Such is their contribution to the sport, that cricket viewers across the globe will be ever grateful to these players for enriching their lives. A lot of cricketers have become legends due to their sheer talent and skill. Also, it goes without saying that they have been successful for a long period of time and hence the elevated status they receive is truly what they deserve. For some legends, true success has come in the way they have led their side with integrity and honor - and not just by getting their hands on any silverware. There is nothing the 34-year-old ABD can’t do on the cricket field. He can defy the laws of gravity while fielding, he can bat left- and right-handed with aplomb, and can make batting look incredibly easy on the eye. And not to forget he has been one of the finest wicket-keepers South Africa have produced. But if there is one thing ABD and South Africa haven’t been able to do, it is getting their hands on silverware of any sort. De Villiers, who has amassed 9558 runs in 228 ODI games at an average of 53.5 with 50 half centuries and 24 centuries to his name, hasn’t been able to win the World Cup. Alas, that was not to be. In an emotional roller coaster in the semi-finals against New Zealand, South Africa lost by a close margin. 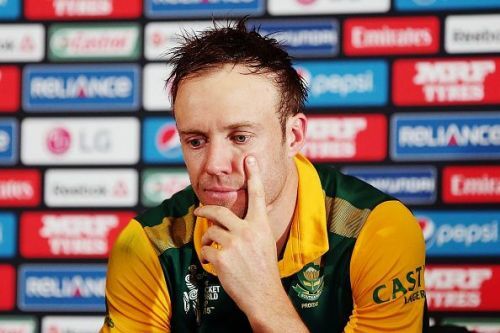 The tears in ABD’s eyes after the defeat symbolized what every South African fan would have felt at that time. With ABD retiring from all forms of the game, the legend will not participate in the 2019 World Cup and thus will not get a chance to finish his career with that coveted trophy.